« CyberPowerPC Gamer Ultra GUA4500A Gaming Desktop Review, Is It Worth Getting? But with as many games that have successfully done it, it shouldn’t be hard to take a little extra time to make sure that the game is well optimized on every platform. Mafia III released two days ago and it has under 60% rating right now on Steam. Why? Because they decided to release the game unoptimized, that’s why. This is just one example too. 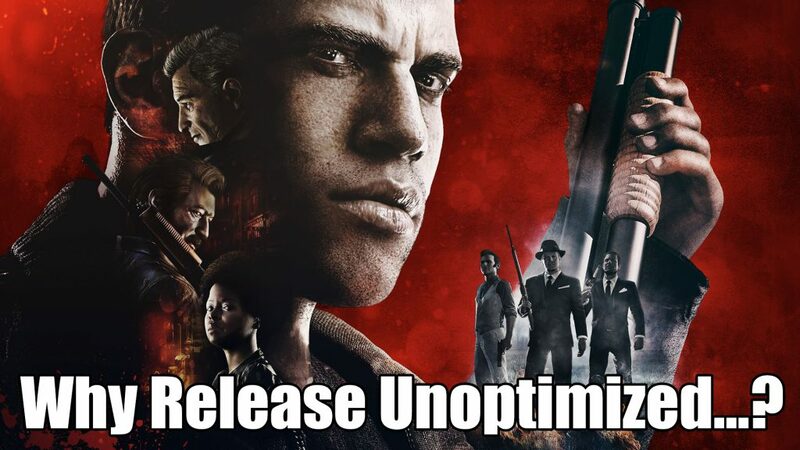 UPDATE: It seems that the patch for unlimited FPS has gone live for Mafia III and I’m happy that it came out fast, but I still feel strongly about developers taking the time to get it right the first time. It shows initiative and it helps to avoid having “mixed” reviews right off the bat. There have been so many titles that have been released that aren’t well optimized and it results in the game getting bad ratings. Bad ratings = less game sales. Less game sales = less money. If developers want to continue doing what they love to do, which is to make great games, then they need to put their attention to what their audience is saying. I’ve heard that there was supposed to be a “weekend patch” going out that fixes a lot of the bugs and what not going on with Mafia III right now but it should not be that way at all. Developers – if you’re going to start your development on a game with consoles in mind and you plan to release on PC as well – PLEASE take the time to optimize the title! I have yet to play Mafia III and I’m certain that it has an amazing story and awesome gameplay elements – there’s no doubt in my mind about that. But mixed reviews on Steam does not help people to make a decision to pick up the game. The bad reviews are a result of the game being locked at 30 FPS and there being a ton of bugs/crashes at launch. Isn’t there supposed to be a team dedicated to testing the game out before it gets released to the public..? With all of the new hardware that just got into the market for PC players and with loads of people investing to get into the higher tier of PC gaming… a 30 FPS lock on PC makes no sense at all. Have developers not learned from mistakes such as Arkham Knight? Releasing a game on Steam’s platform without having little kinks like that fixed right from the get go will result in bad ratings. The developers have supposedly come out to say that a patch is “inbound” but I’m sure that the PC community would not have minded waiting a few more days to get the game to run at a smooth 60 FPS for those of us that look forward to getting our games to run at that frame rate. Hopefully these “patches” don’t take nearly as long as it did for Arkham Knight… it was months before that game got correctly patched. And then there are the reports of the game crashing a lot and what not… it baffles me that big releases like this don’t have a clear understanding that the game needs to be thoroughly tested before release. On different types of hardware. I know that to some it really doesn’t matter and they’d rather just enjoy the game as is and as I said earlier, I’m sure that the gameplay is phenomenal. But with PC gaming at the level that it is at… the highest level it has ever seen… it makes a whole lot of sense to make sure your game runs well on PC. I feel like sometimes developers just don’t think. They don’t observe what happens with other games that don’t optimize before release and that bothers me. Why wouldn’t a team take the time to make sure that the game runs how it is supposed to be ran… why not take the time to make sure it is at its greatest version before releasing it? I don’t know, maybe it’s just me. But it really bothers me that big time developers don’t take the time to get it done. Do you think devs should optimize their games before release? Or are you okay with patches down the road to fix the issues? Tagged 30 fps lock, mafia iii, pc optimization. Bookmark the permalink. Right? If it only took one more weekend then they should wait till after that weekend! I think most people have moved on from “needing” to play the game right when it is announced for release but that’s just my opinion.